This year marks 50 years since the landmark 1967 referendum on Indigenous rights. The Right Wrongs project, a partnership between the ABC, AIATSIS and NSLA, is a powerful collection of stories to mark this significant date. The interactive website highlights what life was like for Aboriginal and Torres Strait Islander communities before the vote, and what has happened in the 50 years since. It includes a mixture of archival and contemporary stories, photos, videos, audio and audience contributed content to explore. One of the stories is of Palawa woman Fanny Cochrane Smith. From 1899-1903, Fanny Cochrane Smith was recorded singing in her Aboriginal language on wax cylinders. It is said to be the only recording of the Palawa (Tasmanian) languages. Her recordings have come to represent resilience and survival, and this year their significance were recognised when they were inducted into the UNESCO Australian Memory of the World Register. 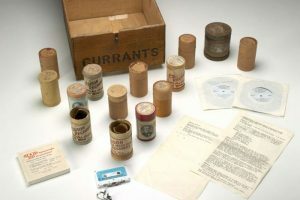 “These recordings are songs of survival and represent the continued struggle for rights and recognition,” said Descendant and TMAG Indigenous Cultures curator Liz Tew in an article by ABC. Before the arrival of Europeans there were hundreds of different Indigenous languages being spoken across Australia. According to AIATSIS, today only around 120 of those languages are still spoken and many are at risk of being lost. Language is more than just a means to communicate, it is an essential characteristic unique to people and communities, and plays a central role in a sense of identity. It is also the vehicle within which much cultural knowledge is stored. In recent years, the Tasmanian Aboriginal community has actively re-established ownership over their language through the development of palawa kani – a program that has revived the many different languages spoken by Tasmanian Aborigines. The project includes a database of words so that community can access, browse, print and download palawa kani language materials for themselves. Two language apps have also been developed allowing users to read and hear words, either singly or through building phrases. The online database will continue to grow as new words are revived. Thankfully there are projects just like this one happening in communities across Australia, led by Indigenous Australians to protect, preserve and strengthen traditional languages. Thanks to the help of technology these languages will not only survive, but continue to thrive.